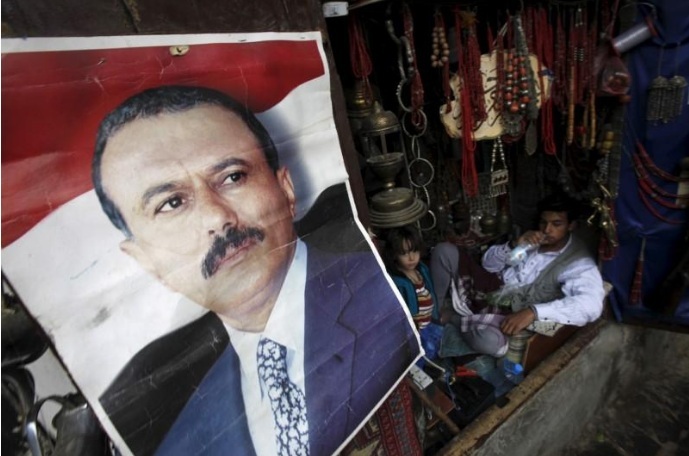 A poster of Yemen's former President Ali Abdullah Saleh is seen on a door of a shop in an old quarter of Yemen's capital Sanaa, April 21, 2016. DUBAI - Yemen’s ex-president Ali Abdullah Saleh has had a successful operation at a Sanaa hospital after a Russian medical team was flown in to perform it, government sources said on Saturday. The Russian team arrived in Sanaa two days ago and operated on Saleh on Friday for wounds he sustained in an assassination attempt in 2011. Saleh was severely wounded in an attack on the presidential palace in Sanaa in June 2011. He went to the United States for treatment on one occasion, before a travel ban was imposed. Forming a surprise alliance with the Houthi movement when they seized Sanaa in 2014, Saleh’s army loyalists and Houthi fighters have weathered thousands of air strikes by the Saudi-led military coalition in more than two years of war. Yemen’s ex-president Ali Abdullah Saleh has had a successful operation at a Sanaa hospital after a Russian medical team was flown in to perform it, government sources said on Saturday. The Russian team arrived in Sanaa two days ago and operated on Saleh on Friday for wounds he sustained in an assassination attempt in 2011.